This is the Exposure Sheet preferences tab. • Show Drawing Columns: Displays the Drawing layers in the Xsheet view. • Show Function Columns: Displays the Function columns layers in the Xsheet view. • Show Annotation Columns: Displays the Annotation columns layers in the Xsheet view. • Show 3D Path Columns: Displays the 3D Path columns in the Xsheet view. • Show Sound Columns: Displays the Sound columns in the Xsheet view. • Centre of Current Frame: Turns auto-centering on or off when playing back a scene. Auto-centering is to be used during sound breakdown with the ShuttleXpress device. • Default Add Columns: The default position where the new column will be added. • Default Column Width: The default width value for the new column being created. • Bitmap Format: By default, when you create a new empty bitmap column, it will use the file format indicated in the field as the new column format. 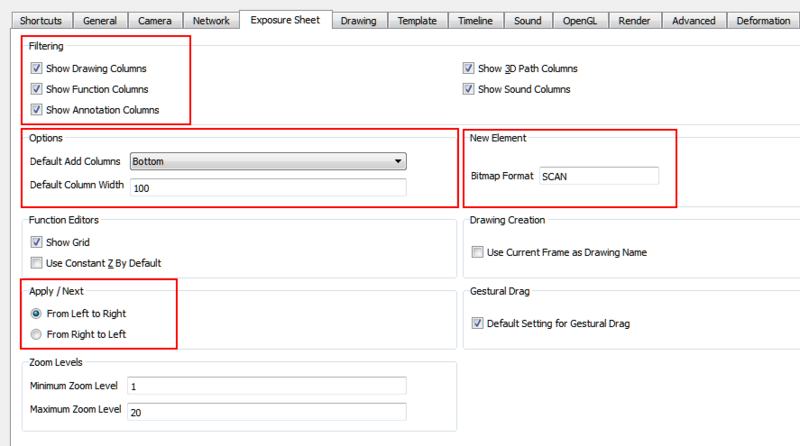 The default value is SCAN, which means that it is set for scanned-in drawings. • Scan Type: By default, the Scan Type is set to 2 which equals vector import. This means that the imported bitmap images will be placed into a Drawing layer. Scan type 1 is bitmap import. • From Left to Right: When clicking on the Apply/Next button in the Xsheet view Column Properties, the next column to be displayed in the Column Properties will be the one on the right. • From Right to Left: When clicking on the Apply/Next button in the Xsheet view Column Properties, the next column to be displayed in the Column Properties will be the one on the left.